What Did Kevin Durant Want Behind ESPN's Firewall? 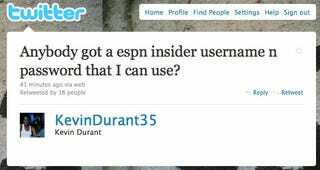 This afternoon, Durant put out the call on Twitter for help getting to something on ESPN.com Insider. But what was it that Durant was so excited to read? We have ideas. Set aside for a second the absurdity of a man making eight figures looking to borrow a password to a site that costs 40 bucks a year (plus an ESPN The Mag subscription!). We poked around the Insider section to see what Durant might have wanted to read. •In all likelihood, it was a blurb in the rumors section about the Thunder looking to get Durant some front court help in the person of Kentucky center Daniel Orton. If I'm Durant, and I see anything about upgrading from Nenad Kristic and Jeff Green, I'm doing whatever I can to find out more. •But it could also have been the latest Player X column from the magazine, where an unnamed NBA "star" calls out Durant for working the refs. After tonight's no-call on his last shot, I think he's considered writing a letter to the editor. •Tonight's AccuScore game predictions? Maybe. Only 28.8 projected points for Durant against the Jazz? He showed that good-for-nothing computer by going off for 45. •John Hollinger's All-Defensive team? Nah, he wouldn't be in that column. The world will continue to wonder.